I am a third generation captain. 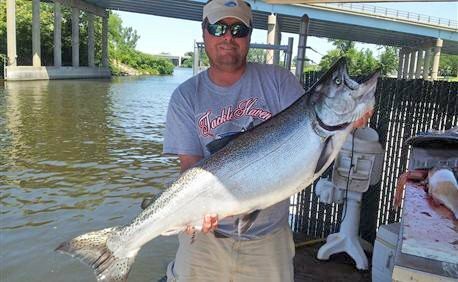 Before I graduated St. Joseph, MI high school, I already held my 100-ton master's captain’s license along with numerous Lake Michigan Salmon and Trout tournament victories all over the lake. Now years later and fishing nearly every single day, I will make sure to use the knowledge I have running through my veins to ensure you the best trip anyone can give. We had a bit of a bouncy ride out with a storm front overhead but Capt. Nate put us right on the fish. We had our first fish on before the second rod was in place. Father (81), two sons (50’s)and a grandson (34) all Limited today. Capt, Nate had everything we needed and did a great job cleaning after the trip. All in all a great day!! We had a bit of a bouncy ride out with a storm front overhead but Capt. Nate put us right on the fish. We had our first fish on before the second rod was in place. Father (81), two sons (50’s)and a grandson (34) all Limited today. Capt, Nate had everything we needed and did a great job cleaning after the trip. All in all a great day!! 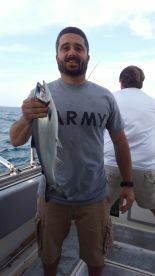 Captain Nate is true professional and has a very clear understanding of fishing on Lake Michigan. 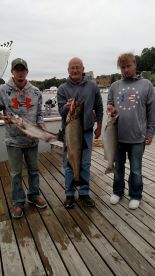 Our group had very little experience with fishing on the big lake and we were able to real in a few each. We had beautiful weather and a wonderful time. We caught several lake trout. I would recommend fish napper charters to anyone interested. 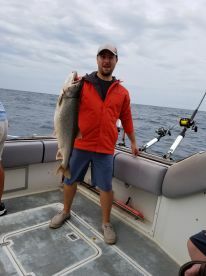 Captain Nathan Ender showed us a great time on the lake knew right where to go helped us get the fish in the boat but stood back and let us have the fun. caught more fish than time. This is a MUST DO TRIP highly recommended THANKS AGAIN CAPTAIN!!! Great chance for a few teenage boys to fish alongside their dad. Nate is clearly knowledgeable, and the views are an added bonus. 18 fish in a few hours! Well worth it.